Rabat, Morocco—Organic composting. Ecotourism. Red algae production. Solar equipment installation. These are just a few of the ideas the youth in Morocco had to improve economic development in their community. With more than half of Morocco’s young working-age population (aged 15 – 29 years) out of school and out of work, youth unemployment is a serious concern for the country’s continued political stability. The Near East Foundation (NEF) is working to empower the youth through an entrepreneurship project that provides training and creates support networks to grow profitable and sustainable businesses. 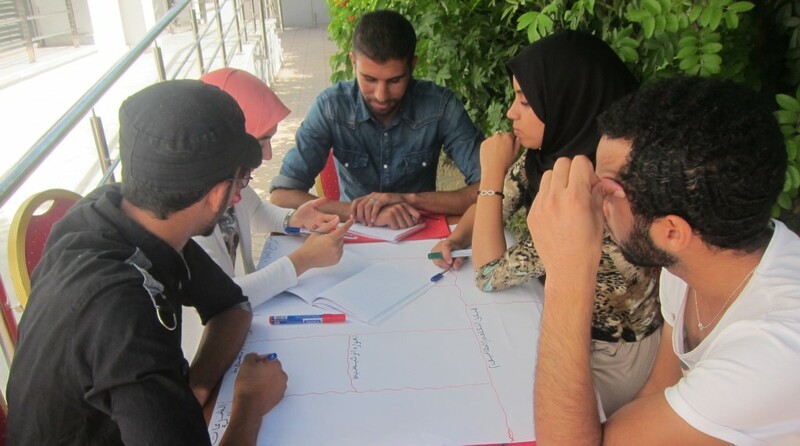 To ensure success in this initiative, NEF conducted an economic assessment with youth and local economic actors to jointly identify unique opportunities for economic development in Morocco. The assessment identified what support would be needed to promote successful youth microenterprise development while overcoming barriers, particularly for non-skilled youth with little to no formal education. While Moroccan youth note substantial challenges to business development, they also demonstrate an ambition to find innovative solutions. By way of technical counseling, identifying market opportunities, and providing financial resources, NEF is working to create a space where these challenges can be discussed and solutions can be found so that young Moroccans can begin implementing their ideas. Findings, suggestions, and recommendations from the assessment were presented in two regional workshops in Morocco and continue to be used to guide NEF’s work with youth entrepreneurs in the region. Click here to view the assessment on our resources page. Click here to read more about our work in Morocco.